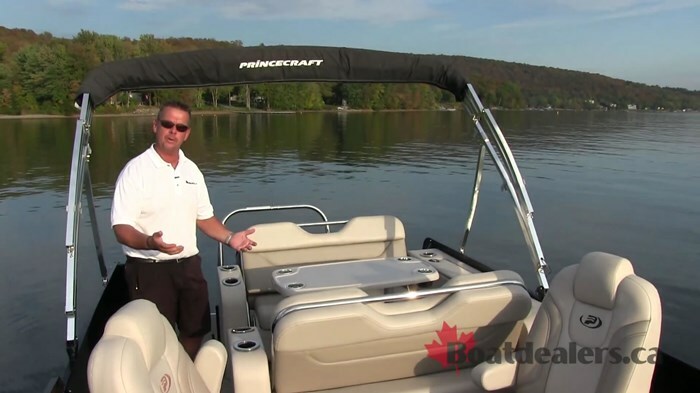 Princecraft has been crafting boats for Canadians since 1954 and now offers 7 different lines of pontoon boats. The Quorum sits in the upper tier of their designs just below their Vogue series and the 25 RL is an all-round family and guests friendly package. With the ability to power this 25’ 8” hull with a range of 115 – 300 HP engines, any consumer can create the package that suits their specific needs. 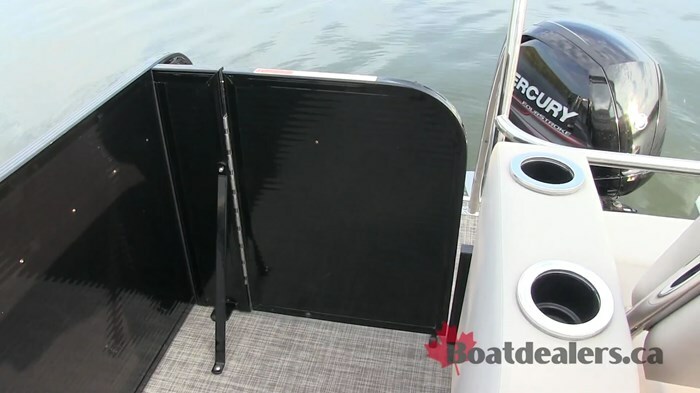 The 27” wide bow and stern gates make for easy egress into the boat and the 24” port side gate is great when docking. All gates feature simple to use lift and lock hinges. The fiberglass helm console features a molded dash panel with black pearl woodgrain inserts, lighted rocker switches, tilt steering, a Jensen 160 watt sound system, four 6 ½” speakers, courtesy interior lighting and LED lighting under the console. 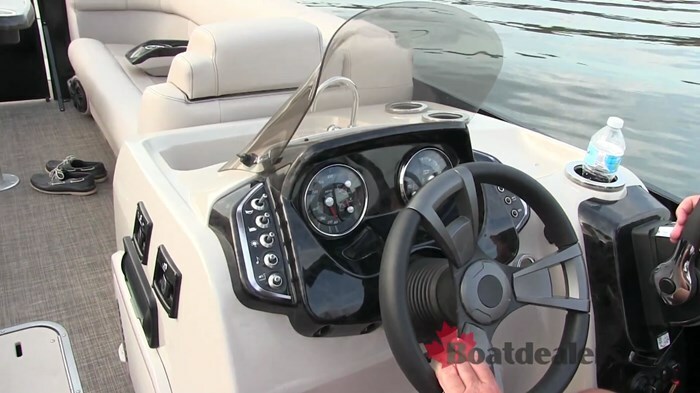 Both the captain’s and passenger seats are on easy to use slides and swivels. 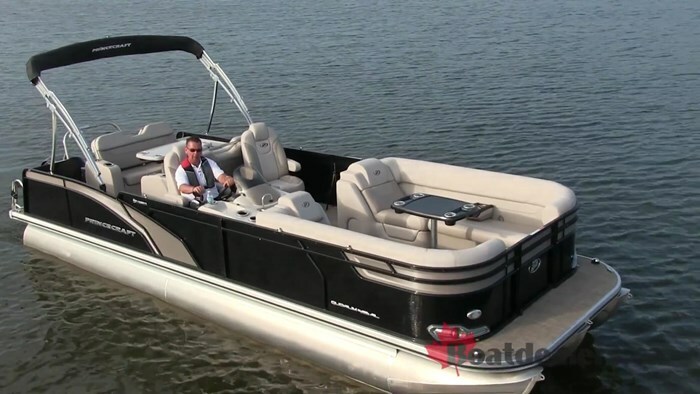 Unique to the Quorum 25 RL is a versatile convertible and huge bench seating area. 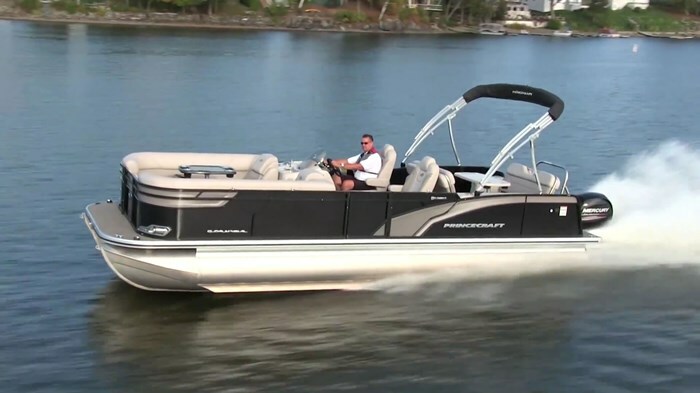 Both backrests feature 3 position adjustability allowing passengers to view forward to the bow, sit up to 6 people comfortably across from each other with a huge snack table in between or position the rear bench to the stern and watch swimmers laughing and enjoying their time in the water. 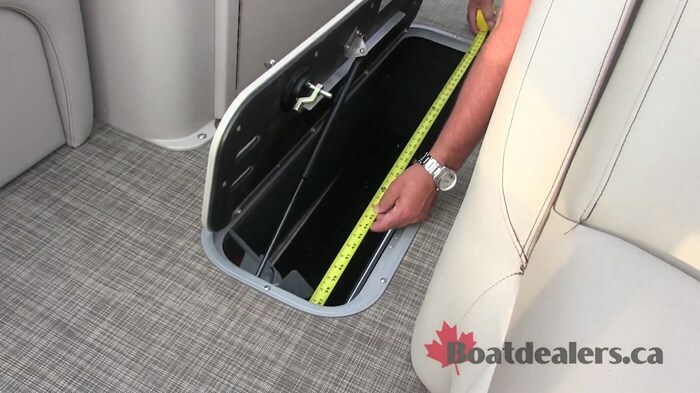 There are storage solutions sprinkled throughout the interior with generous storage under all loungers and a large storage compartment adjacent to the convertible bench area on the port side. The roto cast furniture bases, seat backs and padded arm rests are all ‘no wear’ construction and the seat bases feature a built-in drip design. 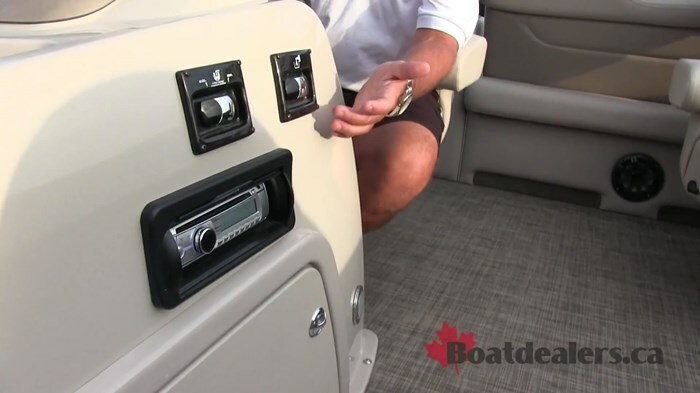 There is a grand total of 24 cup holders (no that’s not a typo) and they are virtually everywhere in the boat. 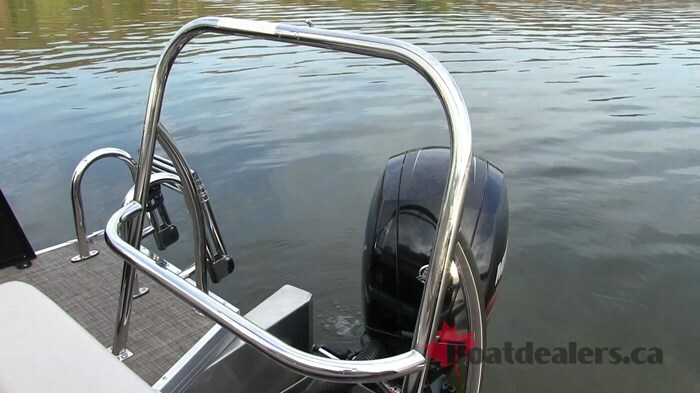 Our test boat was outfitted with Mercury’s 150 XL 4 stroke engine. The hole shot seemed a little sluggish at 4.47 seconds and our top speed of 32 MPH at only 5,000 RPM confirmed our concern. I’m confident that with the right set up the Quorum 25 RL would deliver upper 30 MPH top speeds which is right where she should be for her size. We know most boaters don’t run at top speed and the critical cruising speeds of 19 & 23 MPH kept the hull on plane and cruising nicely. 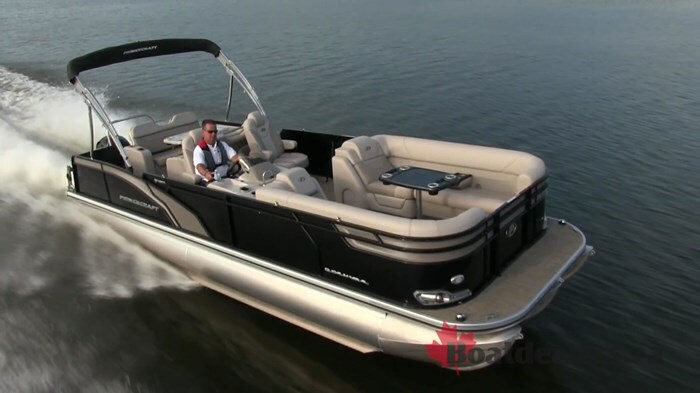 Consumers have a lot of pontoon choices today and the process can be arduous and over whelming. The Princecraft Quorum 25 RL answers the call perfectly for families looking for a big enough package to entertain and enjoy endless mornings, afternoons and evenings on the water.